Editions : There are two editions. When it comes to Star Trek, there's being obsessed and then there is being obsessed. Although phrases concerning stones and greenhouses spring to mind, I will nevertheless say here and now that the Klingon Dictionary is perhaps the most massively impressive monument to Trek obsession that there is, or that there ever could be for that matter. Mark Okrand has quite literally created an entire new and completely fictional language, complete with rules of grammar, pronunciation guide and a set of complex words and expressions to illustrate the nature of Klingon culture. 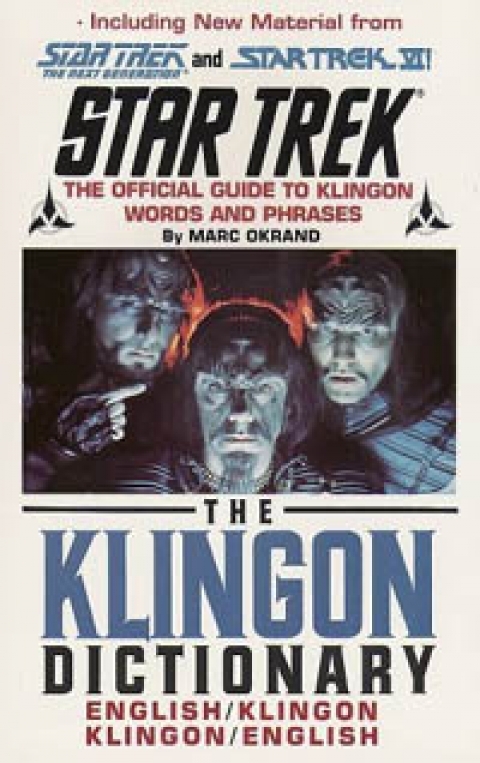 There's even a Klingon phrase book with eternally useful phrases such as "surrender or die!" To be honest, I can't ever see myself learning Klingon. I can't really see myself sitting down and reading through a Klingon book. But this book is kinda like a nuclear weapon - you may never want to use it, but you're glad that it's out there, just in case you need it.